Esau was a little ticked off at his brother Jacob, what with Jacob stealing his inheritance and all. So Jacob sent some servants to bribe his brother with goats, which Jacob kind of stole from Esau in the first place. Jacob: What did he say? Are things cool? Servant: Well, he’s coming to visit. Servant: So just checking, if you die, who gives me my paycheck? Maybe we can set up a direct deposit? Jacob decided this was a good time to start praying. God: That is literally all you do. Jacob: Well isn’t that the tent calling the pyramid pointy. You told my grandfather to kill my Dad. Jacob: I need your help, God. Don’t let my brother kill me. God: I’ll see what I can do. 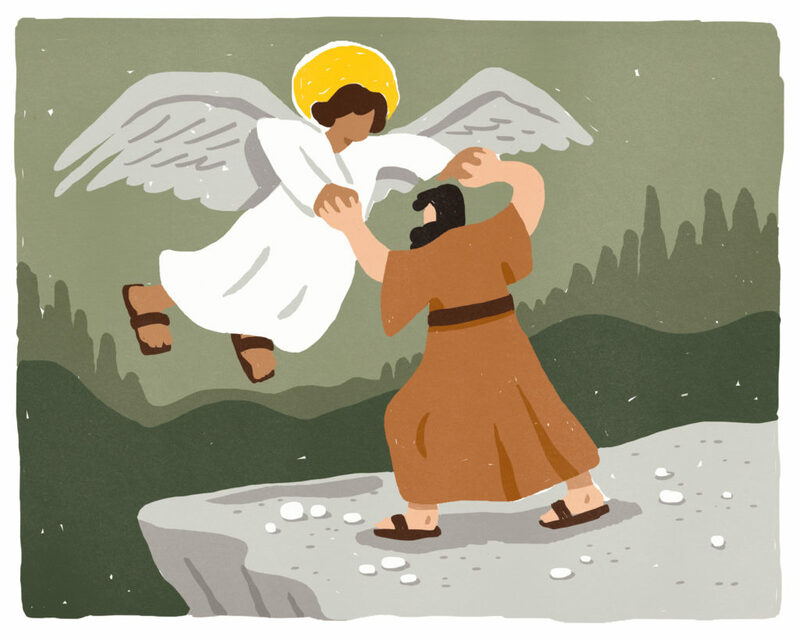 So God sent an angel to wrestle with Jacob, dislodging a nerve in his hip. Jacob: Ahhh, my sciatic nerve! That was my favorite nerve. God: You’re just always complaining, aren’t you? As Jacob limped away, he saw Esau’s 400 men in the distance coming toward him. Jacob: Worst day ever. Rachel, my beautiful wife, center of my world, get behind me. I don’t want anything to happen to you. Leah, my other wife, stand in front of Rachel like a human shield. Esau and his men drew closer. Jacob took a deep breath and bravely prostrated himself in front of his brother, begging for mercy. Esau kissed Jacob’s neck, as bros are wont to do, and the two went back to being friends. Then they traveled to another city, where some dude slept with Jacob’s daughter. This upset Jacob, mainly because he didn’t like the idea of his daughter coming into contact with foreskin. Some Dude: Sorry about sleeping with your daughter and all. I want to marry her. Jacob: Only if you chop off your foreskin. Actually, make that your whole city’s foreskins. Then we’ll be cool. So all the men in the city chopped off their foreskins. Some Dude: Okay, we’re cool now, right? Then Jacob’s sons slaughtered all the men in the city by sword and pillaged all the women.